Paris was quick on Friday to reassure Ankara after President Emmanuel Macron was misquoted as saying that his country would deploy forces in the northern Syrian city of Manbij. Turkish President Recep Tayyip Erdogan quickly responded to the French statements, saying that Manbij would be the next target of his forces to liberate the city from Kurdish Peoples’ Protection Units (YPG). Ankara also rejected any French mediation between Turkey and the Syrian Democratic Forces, led by the YPG, which are considered by Turkey as terrorists. On Thursday, an SDF delegation including Kurdish officials visited the Elysee Palace in Paris. Macron told the delegation he hoped to build dialogue between the Democratic Forces and Turkey, with the help of France and the international community, according to a communiqué from the Elysee. “Those who go to bed with terrorists, or even host them in their palaces, will sooner or later understand the mistake they’re making,” Erdogan said in Ankara. He also warned that Ankara did not need a mediator. “Who are you to mediate between Turkey and a terror group?” Erdogan said at a meeting of the ruling Justice and Development (AK) Party in the capital, Ankara. 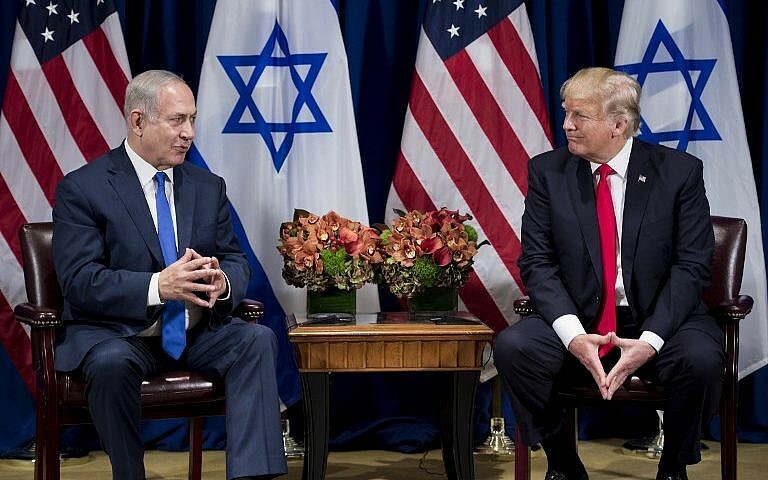 During their talks in Paris on Sunday, Prime Minister Benjamin Netanyahu told French President Emmanuel Macron that he would be prepared to make “compromises and concessions” to the Palestinians within the framework of US President Donald Trump’s much-touted Middle East peace plan, Israel’s Channel 10 TV news reported on Tuesday. The report, which quoted unnamed senior European diplomats familiar with the content of the two men’s discussions, was denied by the Prime Minister’s Office. 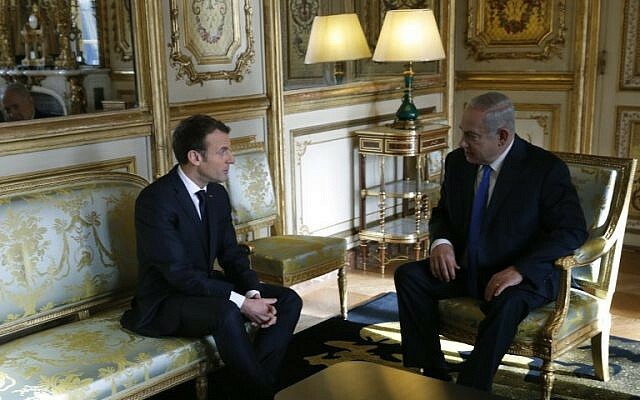 Channel 10 quoted brief excerpts from what it said were exchanges between Netanyahu and Macron in Paris on Sunday, and between Netanyahu and EU foreign policy chief Federica Mogherini in Brussels on the following day. To which Macron reportedly replied, “The trouble is that, in the wake of Trump’s declaration on Jerusalem, it will be complicated to advance a peace initiative.” Last Wednesday, Trump announced that the US recognizes Jerusalem as the capital of Israel, and that he would ultimately move the US embassy from Tel Aviv to Jerusalem. The report quoted the European sources as saying that both Macron and Mogherini were “skeptical” about Netanyahu’s professed readiness to compromise. In a joint press conference after their meeting on Sunday, Macron expressed his disapproval of the US recognition of Jerusalem as Israel’s capital, and urged Netanyahu to “show courage” in advancing peace talks. 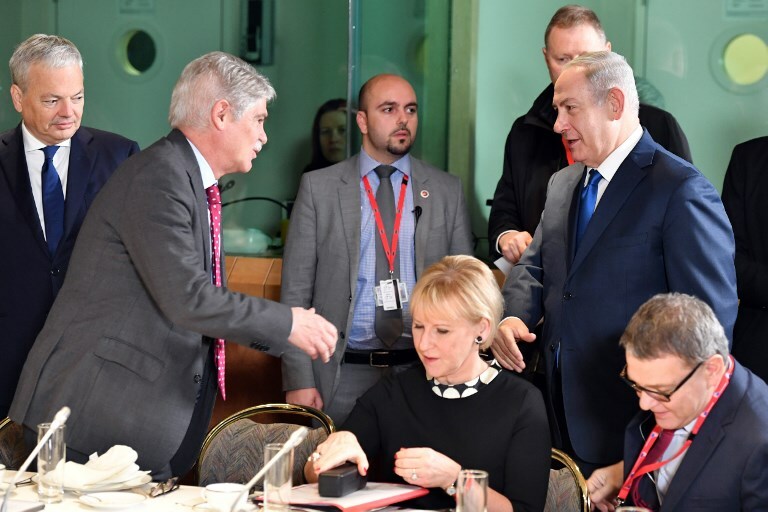 Later Sunday, the prime minister told reporters that he was not yet fully aware of Trump’s peace proposal, but noted that Jerusalem is one of the “core issues” that will be on the table. “We never ruled out that Jerusalem be discussed. The Palestinians have their positions on it, and they are free to bring them up,” he said. “We never rule out discussions — we rule out [certain] results,” he added, noting that his government’s opposition to a partition of Israel is well-known. 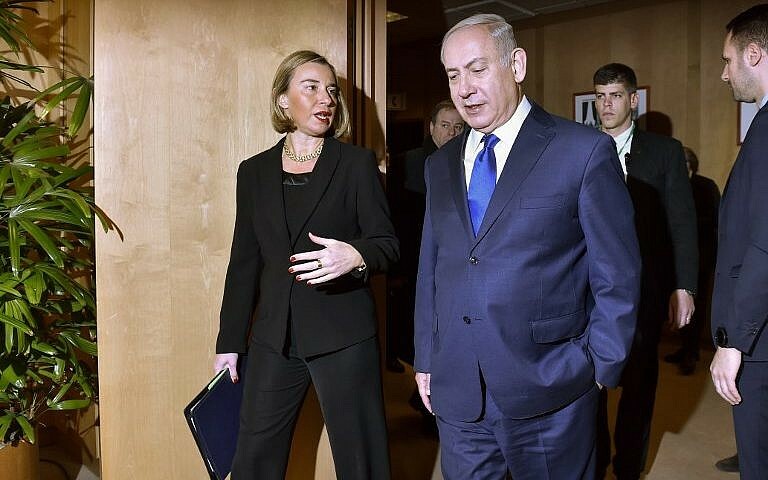 Standing next to Mogherini, the EU foreign policy chief, at the headquarters of the European Union after their talks on Monday, Netanyahu predicted that most countries on the continent would eventually recognize Jerusalem as Israel’s capital and move their embassies to the city. Mogherini later issued a flat rejection of that notion. “He can keep his expectations for others, because from the European Union member states’ side this move will not come,” she said, adding that the bloc — the Palestinians’ largest donor — would stick to the “international consensus” on Jerusalem. She reiterated the EU’s stance that “the only realistic solution” for peace is two states — Israel and Palestine — with Jerusalem as a shared capital and borders based on the pre-1967 lines, when Israel captured East Jerusalem, the West Bank and Gaza Strip in the Six Day War. And she pledged to step up efforts with the two sides and regional partners, including Jordan and Egypt, to relaunch the peace process.